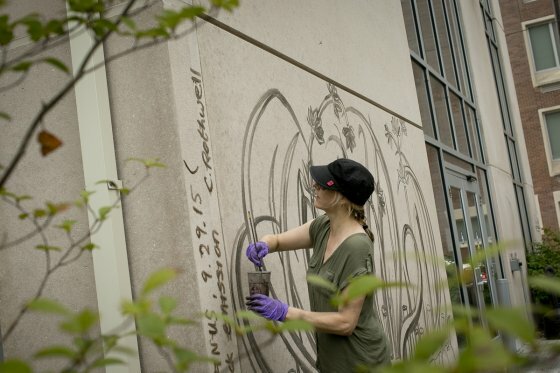 Artist Caroline Rothwell uses carbon emissions from Philadelphia's industrial smokestacks to paint an endangered plant species onto a city building. From smokestacks to exhaust pipes, Caroline Rothwell collects carbon emissions and transforms the soot into paintings of endangered flora and fauna. 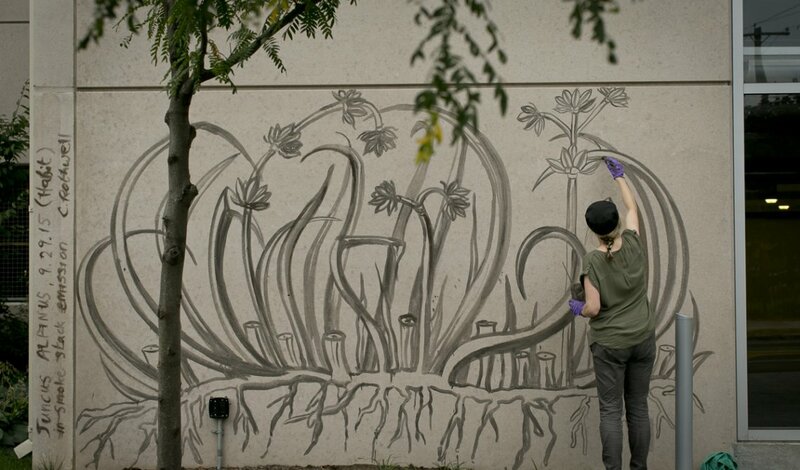 For the large performative wall drawing, Habit - Rothwell uses emissions gathered from Philadelphia's Temple University smokestacks to create a temporary painting of endangered Pennsylvania plants at 11th Street and Montgomery Avenue, Philadelphia. In a process similar to one used in the 19th century in which “lamp black” carbon was collected from the inside of oil-burning lamps to create pigment, Rothwell and her helpers collect soot and mix it with water to create a temporary painting medium. Interested in the absurd action of collecting industrial exhaust emissions as a natural history painting medium, Rothwell's work connects art, science, ecology and ideology. Habit is on view until it fades away.